TORONTO -- The Scotiabank Arena crowd cheered encouragement at Kyle Lowry when he stepped up to the free-throw line to score what would be his first points of these NBA playoffs. Some 40 minutes later, they celebrated the point guard with a standing ovation. They feted Kawhi Leonard with chants of "M-V-P!" Raptors fans breathed a collective sigh of relief. Toronto's win sends the best-of-seven opening-round playoff series to Orlando tied at one game apiece. "Obviously the sense of urgency was at a very high level and the whole team understood that," Raptors centre Marc Gasol said. "We did a great job of executing the game plan for the get go and we played with good energy." 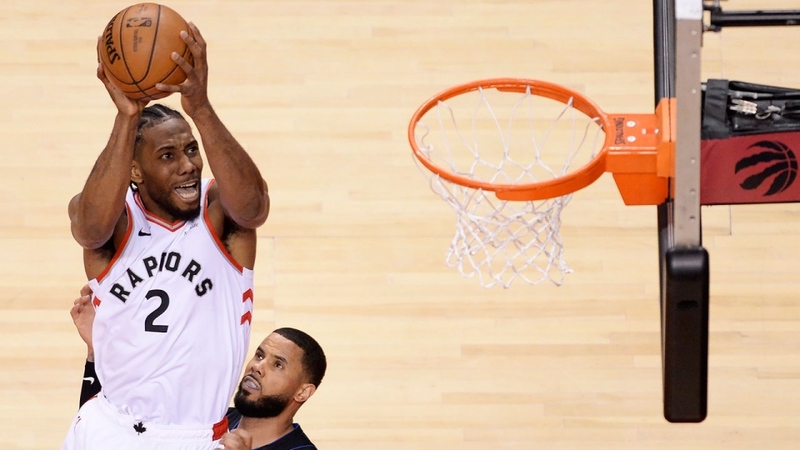 Three nights after a 104-101 upset by Orlando in Game 1, the Raptors roared back with a vengeance, controlling the game from the opening tip off, smothering the Magic on the defensive end like Saran Wrap. "It wasn't flipping the switch, it was more being locked in on every coverage, everything we wanted to do, just being on the same page and communication," Lowry said. "Basically just making sure that we just play hard." Despite being in foul trouble most of the night, Leonard shot 15 for 22 to surpass his previous playoff career-high of 14 made field goals set in 2017 with San Antonio, and received a loud standing ovation from the red-clad Scotiabank Arena crowd when he left the game with just under five minutes to play. "(It was) just all of us buying in," Leonard said. "Just wanting to come out and win this game. We didn't feel like we played our best basketball in Game 1, and just wanted to protect home court -- really, that's it." Three nights after he scored zero points, Lowry got his first point -- a free throw -- just 92 seconds into the game, high-fiving his wife Ayahna, who was seated courtside, on his way to the foul line. Lowry missed his first, but made the second. The crowd erupted. Four minutes later, the five-time all-star drilled a three-pointer on his first field-goal attempt. "He was big-time tonight," Nurse said. "That's him at his finest tonight. He was charging up the floor, pushing the ball, passing, shooting, driving, kicking, made steals, hands on everything, rebounded. He was doing it all. Leonard, who'd been expected to crank his game up a notch when the playoffs tipped off, was brilliant on Tuesday, drawing delighted gasps from the sold-out Scotiabank Arena crowd of 19,964, and when he drew a foul for a three-point play in a third quarter in which he mercilessly punished the Magic, the crowd chanted "M-V-P!" Despite a 58-win regular season, and with a roster built with a championship run in mind, Toronto dropped an ugly decision in their opener on Saturday, conjuring memories of so many previous Game 1 losses and making for a nervous Raptors fan base. But where the Raptors were lackadaisical on defence for huge chunks of Saturday's game, they were locked in from the opening tip on Tuesday, forcing 17 turnovers for 26 points. Toronto committed just seven turnovers for nine points. "Their defence set the tone for the game in the first quarter," said Orlando coach Steve Clifford. "We were not the team tonight that we've been. (Toronto) had something to do with it but we certainly didn't stick with the game and play the kind of basketball we've been playing lately." The Raptors kept Orlando off the scoreboard for the game's first four minutes, sprinting out to an 11-0 lead. They'd stretch their advantage to 13 points before taking a 26-18 lead into the second.